In 2013, we introduced Xfinity TV customers to Watchathon Week. The Collins dictionary wouldn’t name "binge-watch" the word of the year until two years later, but we knew our customers had an appetite to watch TV differently, especially with shows like Game of Thrones, Homeland and Downton Abbey generating so much mid-season buzz. FOMO was born - and Watchathon Week was the answer. Fast-forward five years and Xfinity Watchathon Week continues to grow and expand. This year, Xfinity TV customers watched more than 77 million hours of content during the annual event – up 42 percent from the 54 million hours consumed in 2013. 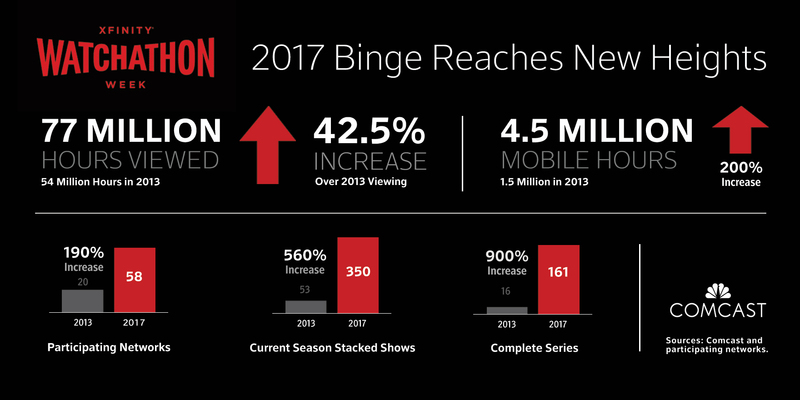 Mobile viewing alone has tripled - from 1.5 million hours viewed during the first Watchathon, to 4.5 million hours this year. And our content partners love Watchathon too! Since the first event, the number of participating networks has nearly tripled (20 to 58) and the number of current season stacked shows available during the week has grown more than six-fold (53 to 350). And now, we’re finding current season stacking isn’t enough. Today’s shows are scripted like novels – our customers don’t want to start a book on chapter five, and they certainly don’t want to start a show on season five either. So being able to watch a show from the beginning is more important than ever and this year’s Watchathon – with the addition of Netflix on X1 – had 10 times more complete series available for viewing – from 16 in 2013 to 161 in 2017. Check out the image below for a more visual representation of how Watchathon has grown over the years.